When you work in home care, you understand the value of person-to-person connections. But in the 21st century, those connections aren’t always made face-to-face. That’s why it’s so important for modern home care businesses to take advantage of social media. If you’re looking for a home care business, Visiting Angels can help. Our franchise opportunities give entrepreneurs access to everything they need to start a successful home care business, including two key types of social media support. One of the great things about social media is its ability to bring like-minded people together. Whether that’s through a comment thread on Facebook, a viral Tweet on Twitter, or through a smaller social network that’s been designed for a specific niche, users now have more opportunities than ever to connect with others who share their interests and concerns. Bringing like-minded people together was precisely the goal behind the Angel Resource Center, or ARC. 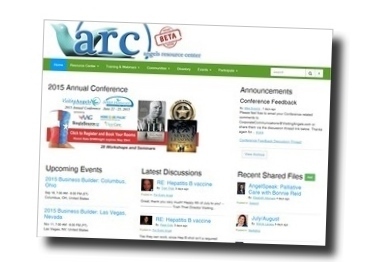 The ARC is a social network open exclusively to Visiting Angels franchisees. Think of it like a private version of Facebook¸ where you and other franchise owners can share advice, ask each other questions, or simply chat about this year’s upcoming conference. In today’s world, social media is often your brand’s most powerful voice. Review sites and Facebook pages have given brands and consumers a new, more immediate way to interact. So it’s important that all business owners have a detailed social media game plan. If you’re considering whether or not to purchase a Visiting Angels home care business, you’ll be happy to learn that we offer detailed support when it comes to social media marketing. Nationally, we operate a range of social media accounts to give our brand its strongest voice. Just as importantly, our communications experts work with local owners to develop a strong and healthy social media presence. Looking to take the leap toward financial independence and self-sustained success? If so, Visiting Angels can provide you with the framework to start your own, highly lucrative home care business. To find out if there’s a home care business for sale in your area, simply check out our territory map, then get in touch with our team for more information. Learn more about home care businesses for sale from Visiting Angels and join our network of successful franchisees.